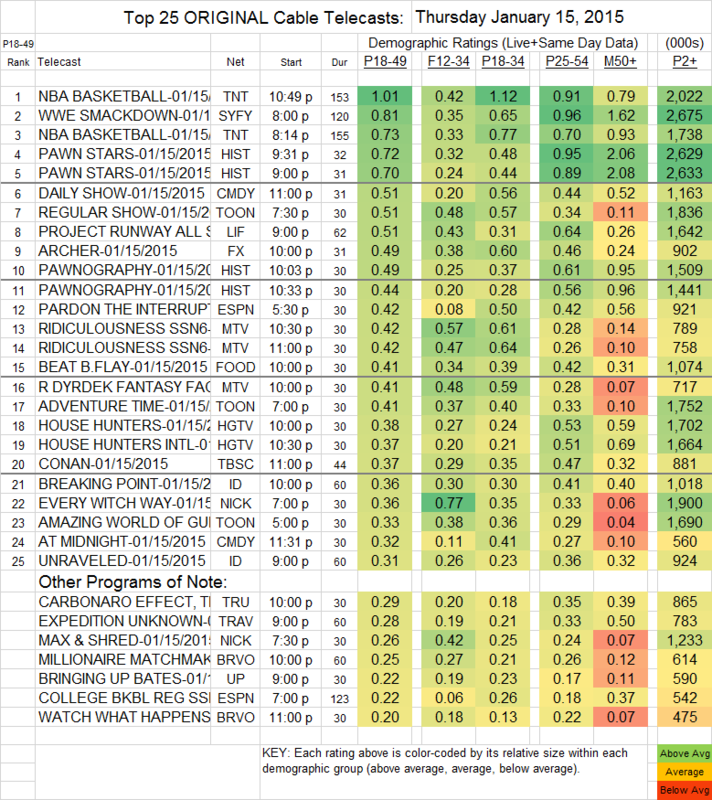 NETWORK UPDATE: AMERICAN IDOL gained 0.1 in final ratings, and the WORLD DOG AWARDS also retrieved an extra 0.1. Sports topped Thursday cable, with TNT’s NBA doubleheader at 1.01/0.73, and Syfy’s WWE coverage between them at 0.81. PAWN STARS (History) at 0.72/0.70 was similar to last week’s 0.71/0.66, and PAWNOGRAPHY’s 0.49/0.44 compared to 0.54/0.50. PROJECT RUNWAY ALL STARS (Lifetime) climbed 0.06 to 0.51. ARCHER (FX) fell steeply from last week’s premiere 0.77 to 0.49. Both halves of RIDICULOUSNESS (MTV) were down a tenth to 0.42/0.42, and ROB DRYDEK’S FANTASY FACTORY was off a tick to 0.41. Bravo’s MILLIONAIRE MATCHMAKER lost 0.17 to 0.25. Not on the chart: BABYLON (Sundance) was at 0.002, with 63K total viewers, and PORTLANDIA (IFC) at 0.11 and 223K total viewers.